18 Classic Blue and White Floral Porcelain Vase, Double Lion Head Handles Ch.. Made in Jingdezhen, China, this traditional Chinese blue and white floral design porcelain vase has a touch of dynasty elegancy. It brings a wonderful accent refinement to your interior decor. It goes well with any kind of fresh flowers or artifictial one, or just displays for decoration. 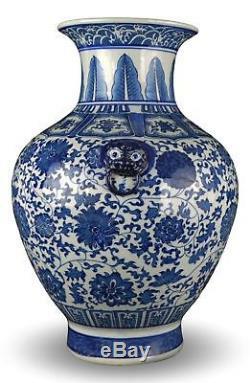 Classic blue and white porcelain vase with double lion head handles Ming style. Size:18"high, 13.5" diameter, with fabric gift box. Beautifully designed with vine and flower pattern. 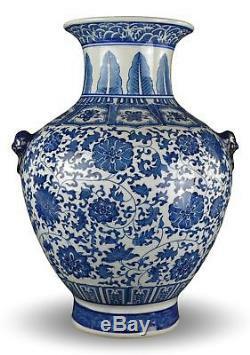 Around vase, there are sea wave pattern on neck and eight oriental lucky motifs on shoulder. 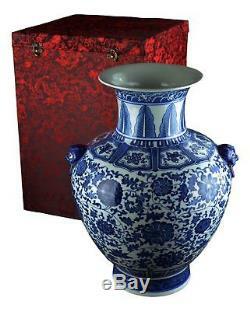 One of most classic and popular shape vases in China. Product Dimensions: 13.5 x 13.5 x 18 inches. Have peace of mind knowing that your order will arrive original factory sealed packaging. The item "18 Classic Blue and White Floral Porcelain Vase, Double Lion Head Handles Ch" is in sale since Wednesday, November 01, 2017. This item is in the category "Antiques\Asian Antiques\China\Vases". The seller is "festcool" and is located in US.